Steve Downs of Project SALAM, Support And Legal Advocacy for Muslims, was the featured speaker at a meeting of Progressives In Action at the Grapevine Restaurant on April 12. The subject of the presentation was pre-emptive prosecution in America. Much, but not all of it is aimed at Muslims and Arabs. Downs stood in front of three large boards displaying the names of people who have been pre-emptively prosecuted. The three boards displayed 150 names. 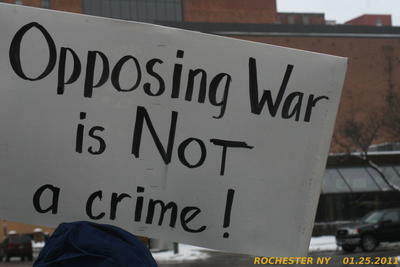 The anti-war and international solidarity activists who are being called before a grand jury in Chicago have learned that beginning a few months before the protests against the Republican National Convention in 2008 in St. Paul, Minnesota, a law enforcement officer infiltrated the Twin Cities Anti-War Committee (AWC). The infiltrator went by the name Karen Sullivan, joined the AWC in April 2008, and about a year later she joined the Freedom Road Socialist Organization. Also, we were informed of a new police policy to video tape political protests. 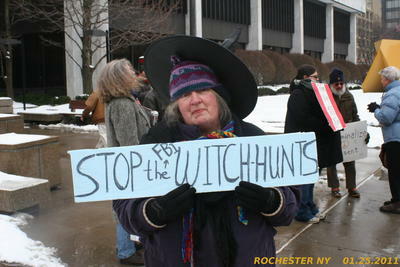 ATTENTION ROCHESTER ACTIVISTS: You are being watched. 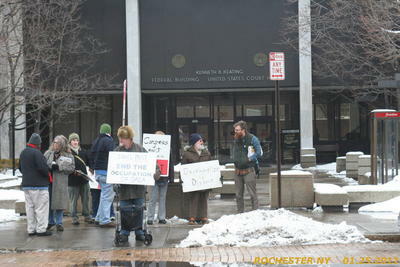 According to the Sergeant called to the "scene" of this morning's 7-person informational picket against mayoral control, it is now a policy within the Rochester Police Department that any public protest is to be filmed, photographed, or otherwise surveilled at the discretion of the commanding officer. NOTE: This policy does not apply to ALL protests across the board--only the ones deemed worthy by whomever is in charge. UPDATE: The officer who gave us this information identified himself as Sector Supervisor, Sergeant Charles Zlotkus. 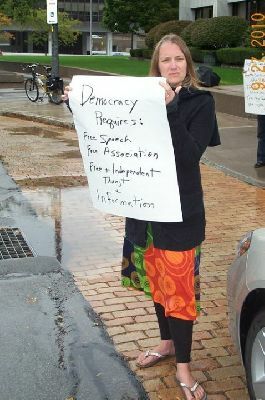 Read more about ATTENTION ROCHESTER ACTIVISTS: You are being watched. Missed the rally on Monday? Angry at the systemic oppression being doled out by the FBI in the forms of house raids and federal grand jury subpoenas across the land? Well, don't worry--there's another demonstration this week for YOU! Come show your solidarity for peace and social justice activists as well as your rage against the FBI for their intimidation and violent tactics!